ODINISM, like every organic heathen faith, is a growing, evolving and ever-changing belief system. 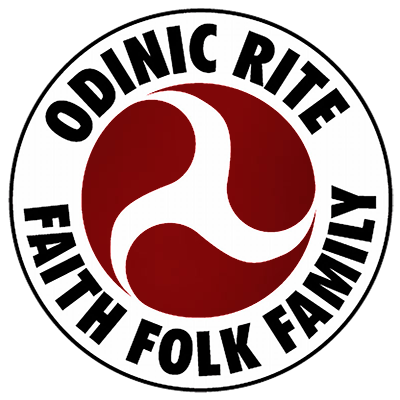 Odinists look to the past eras of the uncontaminated faith for inspiration and wisdom, but we equally look to the present and future to adapt our ancestors’ accumulated knowledge and experience to present-day needs. Just as we know that the beliefs and practices of the Bronze Age evolved continuously throughout history, through the Era of Migrations and down to the ‘Viking Period’, they continue to adapt themselves to time and place in the modern world. In ‘contradistinction to monotheistic creeds, evolution is an inherent aspect of polytheism’. However, an evolving faith implies evolving gods, who are the object or subject of the faith. Gods rise or fall in prominence in the mythology and in popularity amongst the folk. They develop and diversify their attributes and aspects in the course of time. Furthermore, new gods arise. Hence the myths tell of the birth and growth of ‘younger generations of deities. (The Eddas exhibit a highly sophisticated, indeed a very modern, understanding of the process of evolution in the story of the Ragnarok, which tells of younger gods perpetuating the divine and natural order under new sovereignty. Does this current of change and evolution undermine the authority or security of our beliefs? No, because gods, like men, are part of an ever-evolving nature; and the gods are an aspect of mankind who in accordance with the laws of nature are continuously evolving and diversifying. The gods, that is to say the gods of all the world’s faiths, can be understood as the guiding, driving forces of evolution in nature, which naturally includes mankind. Just as homo sapiens has evolved from homo erectus; just as society has evolved from the primitive to the civilised; so our gods have developed, Odin from a wind-god to a god of spirit and inspiration, Thor from a thunder-god to a god of strength and courage. The diversification of nature, of which the gods are an operative force on a spiritual plane, should to nature-minded heathens be a cause of joy and wonder. The expanding star systems, the ever-changing configuration of the continents, the myriad species of plants and beasts, the racial diversity of mankind, all are woven into the ever-changing pattern of wyrd. The threat to this pattern comes from man and his perverse desire to interfere with nature and direct its course of development himself. On a spiritual level this urge is epitomised by the universalist god of monotheism. This perversity manifested itself in the National Socialist period in Germany when some people seriously considered the prospect of creating or breeding a new race, a super Nordic ‘homo superior’. Today the same perverse spirit has laid the ground plan for the breeding of another new race, a ‘homo universalis’, a plan which is already in hand. The diversity of man has been declared a crime and we are at war with nature in an insane attempt to reverse 200,000 years of evolution. Why else have the gods arisen in the last few years but to defend themselves, as at a Ragnarok, from a mortal threat to the folk-souls which first gave rise to them and which they evolved? For the evolution of man does not concern only or even primarily his genetic characteristics. It also produces a diversity of belief-systems, patterns of mentality, cultures, linguistic media of communication, customs, laws, pantheons, mythologies and spiritual archetypes; in short, evolution creates a plethora of folk-souls. Man, as body and spirit, evolves naturally in both capacities. It is sad but true that Odinism will not be accepted in the establishmentarian, conformist, respectable society of today’s world. There is no use pleading with us not to rock the boat. Every single one of us, at some stage in our spiritual development, has asked ourselves where our spiritual roots lie. Had we not done so we would never even have thought of our ancestors’ faith as a real option. And in daring to look at our roots, to our forebears, to the evolutionary processes which produced us, such as we are, and in identifying ourselves with that evolution, we broke modern society’s most feared taboo. Thus we have become spiritual revolutionaries.